The West is in the midst of another intense wildfire season. Recent weeks have seen dangerous fires from Nevada to Montana; a state of emergency has been declared in Arizona. With President Donald Trump proposing to cut the Forest Service’s firefighting budget by nearly $300 million, the question of how to manage and fund wildfire suppression on public lands has again reared its head. Over the past decade, as wildfire season has lengthened and fires have grown more severe, firefighting has claimed more and more of the Forest Service’s funds, accounting for 56 percent of its overall budget in 2016. Conservatives in Congress have long tried to push legislation that, though ostensibly geared toward wildfire risk reduction, would benefit the timber industry. And with a Republican majority and an administration intent on rolling back environmental review processes, such legislation may gain more traction this time around. 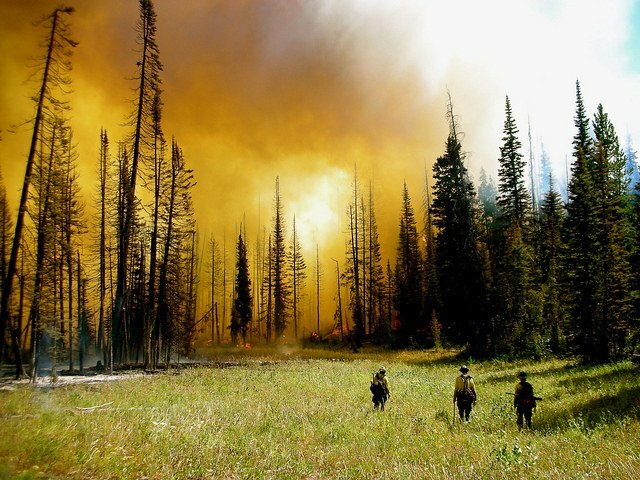 Fire crew members take instruction while observing the 2008 Willow Fire in the Caribou-Targhee National Forest from the safety of a meadow. First introduced in 2015, the Resilient Federal Forests Act is one such attempt. The self-described only forester in Congress, Bruce Westerman, R-Ark., re-introduced the bill in the House last month. “This legislation will streamline the permitting process for proactive thinning projects while simultaneously ensuring reforestation activities,” cosponsor Rep. Paul Gosar, R-Ariz., said in a press release. That “streamlining” would be done in part through expanding the use of what are called categorical exclusions. The exemptions would increase the acreage that could be thinned or logged without public input and full environmental review, from 3,000 acres currently to 10,000 acres. The bill would also allow the Forest Service and the Bureau of Land Management to skip required consultations with the Fish and Wildlife Service if the land management agencies say a project isn’t likely to harm federally protected species. But environmentalists—and House Democrats—disagree, citing concerns that the bill would fast-track logging projects and sidestep environmental considerations under the banner of wildfire risk mitigation. The bill is “a wish list for the timber industry,” says Susan Jane Brown, wildlands program director and staff attorney at the Western Environmental Law Center, noting that the Forest Service didn’t ask for the expansion of categorical exclusions. “It’s the timber industry pushing forward with that ask throughout the bill,” Brown says. A hotshot crew member surveys burnout on the 2002 Toolbox Fire in southern Oregon’s Fremont-Winema National Forest. The Resilient Federal Forests Act also addresses wildfire management funding, an increasingly urgent problem. 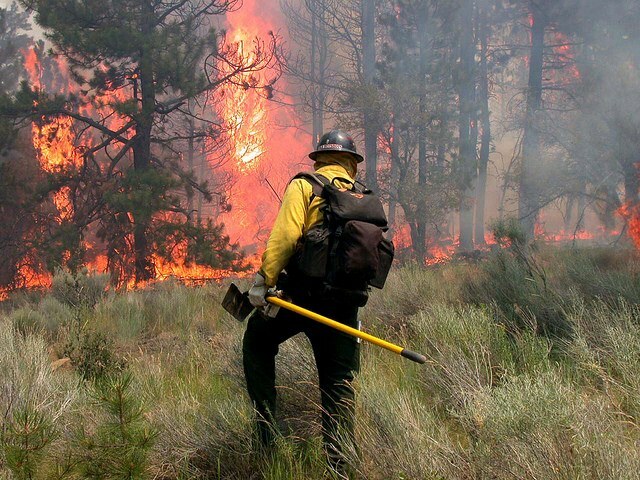 In 1995, the Forest Service dedicated 16 percent of its budget to firefighting. That number ticked up to 40 percent by the early 2010s, and rose above 50 percent by 2015. Currently, fire suppression costs are subject to a budget cap based on the average cost over the last ten years. When costs go higher, agencies like the Forest Service are forced to use resources allotted for other purposes – so-called “fire-borrowing.” This practice translates to less money for other important programs, including those meant to reduce future fire danger. Under this bill, the Forest Service and the BLM would be able to tap into Federal Emergency Management Agency funds to fight catastrophic fires. The Western Governors’ Association, which has long sought to end fire-borrowing, suggests that a “comprehensive solution should address capacity constraints and allow for a predictable program of work for agencies to fulfill their management responsibilities,” according to a spokesperson. The Wildfire Disaster Funding Act, first introduced in 2013, represents a more comprehensive alternative, at least when it comes to funding. Introduced again in June by Rep. Mike Simpson, R-Idaho, the bill would create a new funding process, under which agencies’ disaster budget caps could be adjusted as the cost of fighting wildfires increases. The bill has the support of major environmental groups, including the Sierra Club and the Wilderness Society, and enjoys bipartisan support in the House, with over 60 cosponsors, while the Resilient Federal Forests Act has only eight. Both bills have failed to make it through the Congress in the past and that could be the case again. But Brown notes that parts of a piecemeal bill like the Resilient Federal Forests Act could be “plucked out and put onto other moving vehicles,” must-pass legislation that would be much more challenging to stop. “The potential for doing harm is high with this Congress,” she says.